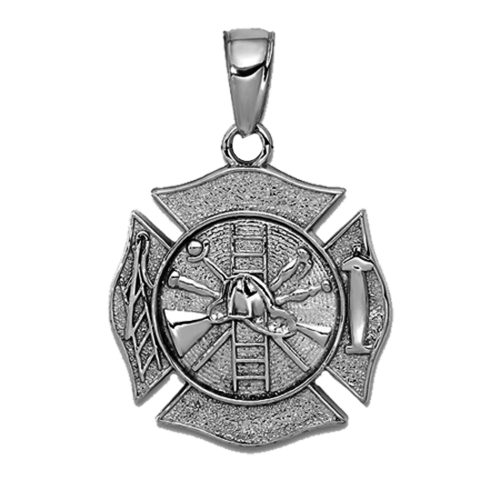 Gold 3-D Fireman pendant. 14k White gold is about 1 inch long and weighs 3.83grams. 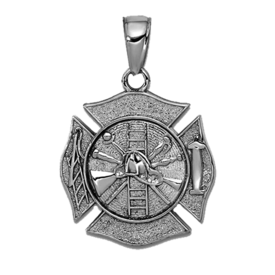 This proud pendant is created in the United States to honor our brave Firefighters. Incredible 14k White or Yellow gold diamond encrusted dog tag style pendant. This pendant is set with 3.82 ctw round diamonds that are a vibrant SI 1 clarity G-H color. Pendant weighs 16 grams and measures 32mm in length by 22mm across. It's about 2mm thick. Looking for something larger? Two additional sizes are available in this amazing design. Next size up is 43mm in length by 30mm across and set with 4.61 ctw diamonds. The largest measures over 2 inches at 57mm in length by 34mm across. Diamonds total an unbelievable 8.9 carats and this size is 43grams. WOW, that's a BIG BOLD statement!!!! Email for additional pricing. 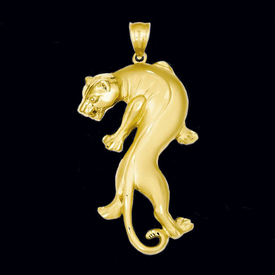 Beautiful 14k yellow gold stalking Tiger pendant. This incredible pendant is available in 2 popular sizes, our price shown is for the smaller 22mm in length by 18mm across weighing 2.9grams. The much larger selection measures 32mm before the bail (42mm with bail) by 25mm across with a 6.8gram weight. Very detailed gold Tiger pendant. 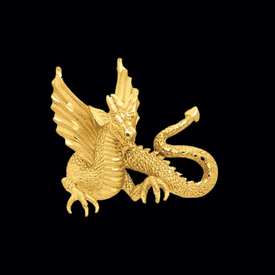 Fierce 14k white or yellow gold Dragon pendant. This great Dragon is a 3-Dimensional design and weighs around 3.03grams. He measures 25mm top to bottom before the bail. Stunning 14k Yellow gold Magnificant Stallion pendant. This incredible horse measures 41mm top to bottom including the bail by 40.5mm across. Horse pendant features a textured and polish finish and an open back. Pendant weighs about 12.2grams. Brilliant 14k yellow gold Dragon pendant with a diamond cut design and a beautiful textured satin and polished finish. Dragon measures about 37mm top to bottom and weighs an incredible 11.5grams. This pendant is very detailed in design, a magnificent masculine pendant. 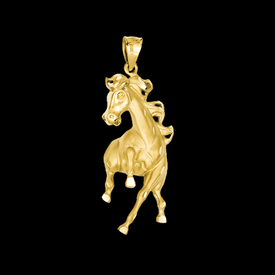 Incredible spirited horse pendant in 14k yellow gold. This horse measures 49.5mm from the top of his majestic mane to the tip of his hoof, he's 21mm wide. He is a solid casted design with a textured open back. Satin and diamond cut polished finish give his a beautiful look. If you are an equestrian or just love the free spirit of the horse, you'll love this pendant. He weighs a fabulous 9.18 grams. 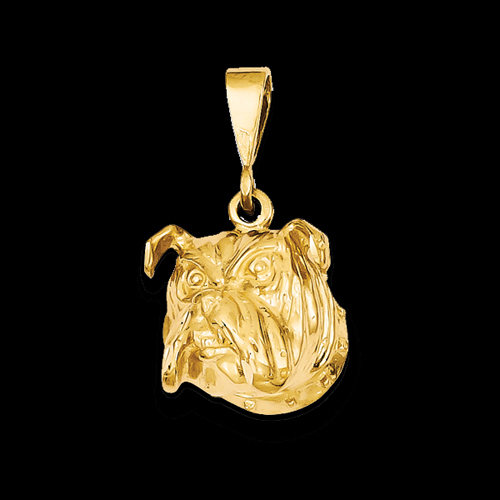 14k gold Bulldog pendant. 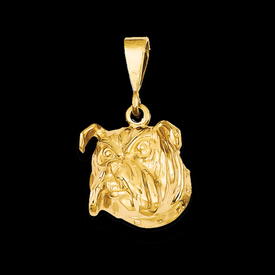 This tough bulldog pendant measures about 26mm long by 16mm wide and he weighs 4grams. Gold pendant features a satin and diamond cut finish. Simply gorgeous 14k yellow gold Crocodile pendant. Incredible satin textured body accented with diamond cut and high polish head creates this stunning pendant. Crocodile measures 32mm in length and she weighs about 3.54grams. Back of this pendant is open and it's a casted item made in the United States. Incredible American symbol, 14k yellow gold hunting Eagle pendant charm. 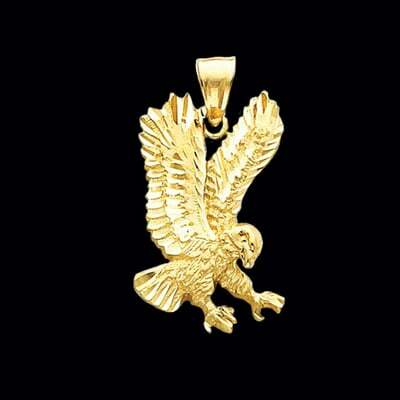 This majestic Eagle is bold at 32mm top to bottom and weighs around 5.32 grams. Gold pendant is a casted solid piece with an open back and a polished finish. A wonderful gift. 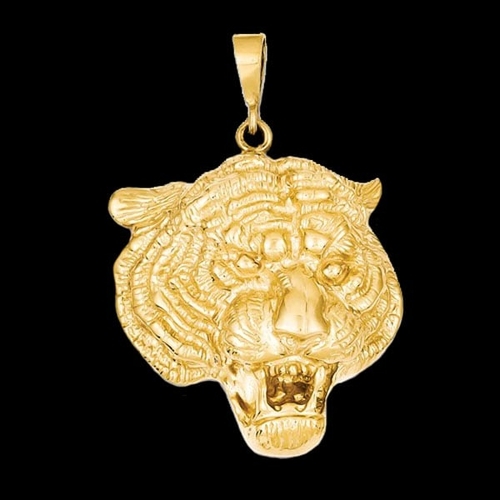 Legendary 14k Gold Tiger face pendant. Tigers are the King of the Cats and this Tiger defines their masculine beauty. This big cat measures 30mm across and weighs a fabulous 11.9grams. From his cuddly ears to his massive jaws, he's one tough kitty. 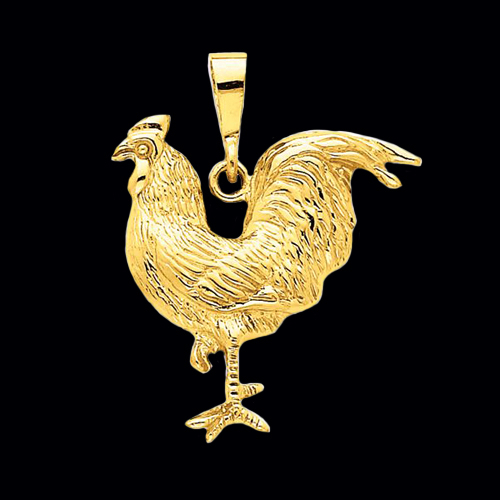 14k yellow gold big Rooster pendant. Solid 14k gold open backed rooster pendant measures 32mm top to bottom by 26mm across, weighs 4.41grams. Finish on this pendant is a textured and polish combination. Gorgeous 14k yellow gold Panther pendant with a diamond cut accents and a beautiful textured satin and polished finish. Panther measures about 55mm top to bottom, that's over 2 inches and weighs an incredible 10.90grams. This pendant is simply incredible, very detailed. 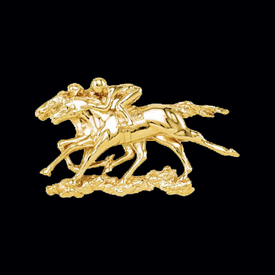 This 14K Gold Magnificent Horse Pendant measures approx. 35mm from head to hoof. A Magnificent Pendant, weighs 9.8grams. 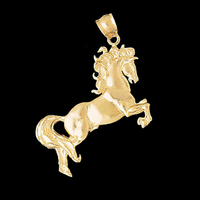 You'll love wearing this gorgeous gold horse pendant anytime. Gorgeous 14k yellow or white gold horse race pendant. Beautiful horses are down to the wire in this luxurious pendant symbolizing a great horse race. This pendant weighs 23.28 grams and also has the ability to be worn as a brooch. What a lovely accessory to wear at your next equestrian event. Pendant measures 60mm wide by 34.5mm tall. Very large pendant. 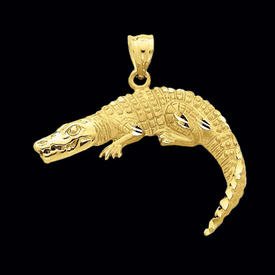 Gorgeous 14k yellow gold Alligator pendant. You won't see him in the murky swamps but he will look great around your neck. This Alligator is large and in charge. He weighs in at 6.2 grams, he's a big beautiful boy. This 'gator can be created in 14k yellow or white gold. 14K Gold Bulldog Pendant, Spike. 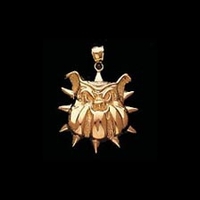 He's Ruff (rough) and Tough, are you tough enough to wear this pendant? Spike weighs 7.9grams and measures 29mm x 29mm (25mm - 1 inch). 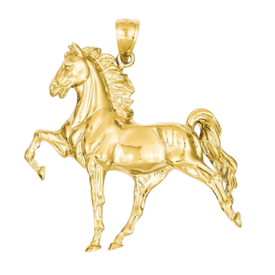 14K Gold Magnificent Stallion horse pendant. This Majestic creature measures 37mm in length and weighs 4.8grams. (25mm - 1 inch) Special order this incredible design in 14k White gold or Platinum. This Stallion is a beautiful symbol of strength and spirit. 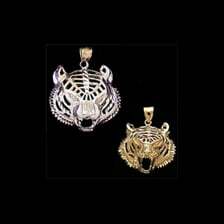 14K Yellow or White Gold Tiger Pendant. This Fierce Tiger weighs aprox. 11.5grams and measures 26mm x 30mm across. A Great Pendant. 14K Gold Blue Shark, a powerful symbol. The top of this shark is a Polished gold while the underside is a sand blast textured finish. Measures 41mm across, weighs 4grams. Very Attractive Pendant.